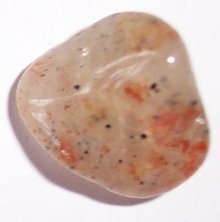 The Sunstone is used to lend extra physical energy to the body during times of illness or stress. Placed before a flaming white candle the sunstone will spread protective energies throughout the house. Symbolically, this rare stone is linked with the moonstone.